I started by cutting both a piece of Elegant Eggplant and Whisper White cardstock using the Spellbinders Labels Eighteen Dies. The lavender image was stamped in StazOn Black on the Whisper White piece and colored with an Almost Amethyst marker highlighting it in Adirondack Purple Twilight. The leaves were colored with a Mellow Moss marking adding hints of Sage Shadow. The sponging around the image is also in Sage Shadow. The coordinated expression was stamped in Elegant Eggplant on a double ended ribbon banner die and sponged with Sage Shadow. I thought this piece of Kaisercraft Lilac Avenue paper coordinated nicely. 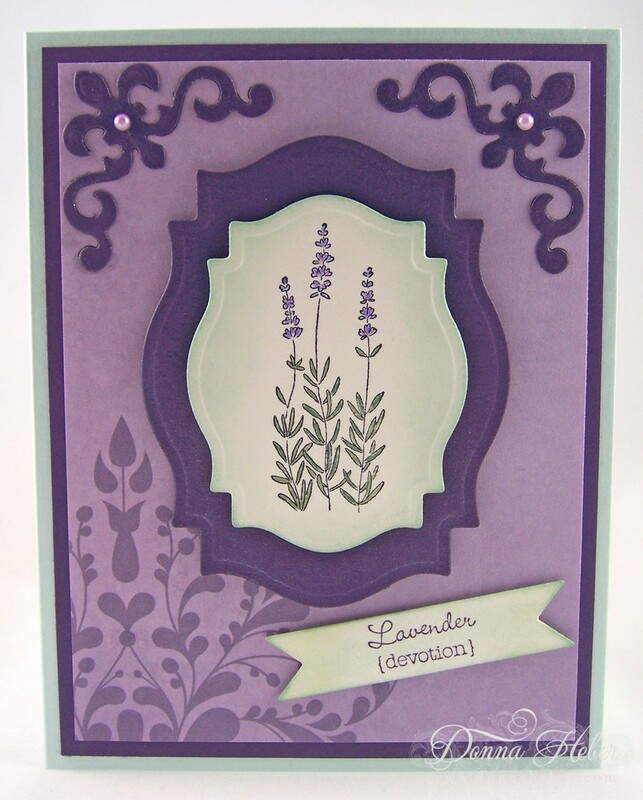 Spellbinders Fleur De Lis Accents were painted with Periwinkle Shimmerz Paint then applied to the corners. I added some Kaiser Pearls in lavender and adhered everything to a piece of Elegant Eggplant cardstock and then to an Aquamarine metallic card. Thank you for taking a few minutes out of your busy day to visit me. Happy stamping! a beautiful card you have made donna. This is lovely Donna, lovely design and colors. I love lavender and you created a most beautiful lavender card - very skilled creation. Love the flourishes with the added bling! Pretty shades of lavender. Lovely card Donna. You do purple perfectly! This card is stunning! Love the swirl accents in the top corners! Love the light sponging-just the right touch! Donna Love this card , all the instructions so helpful. Inspiring me to try something similar. 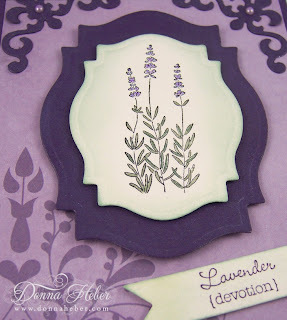 Beautiful card and I love the shades of purple. I can almost smell the lavender by just looking at this card. Very elegant. Reminds me of my niece because her favorite color as she was growing up was purple. Your sponging really adds depth to the card. Beautiful! Love the corner designs.